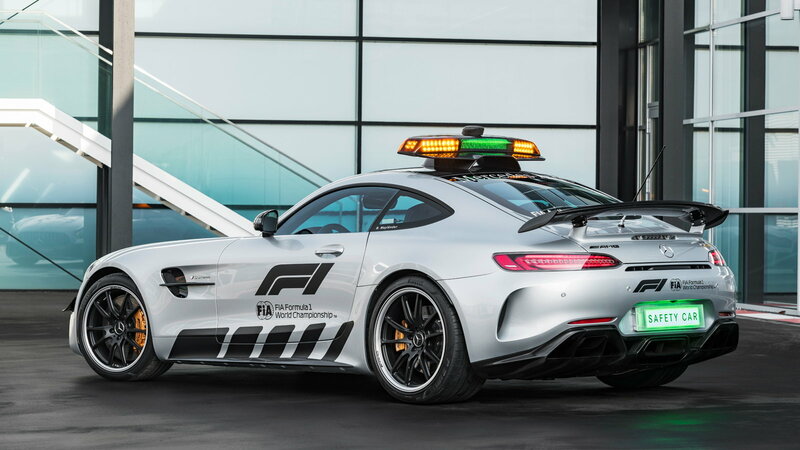 The official FIA F1 Safety Car for the current 2018 Formula 1 season is the twin-turbo Mercedes-AMG GT R.
We're not sure if Formula One Safety Car clones are a thing, the way Indianapolis 500 Pace Car replicas are (or have been in their assorted heydays), but we wouldn't be surprised if they become one with the appearance of the Mercedes-AMG GT R on the scene. Mercedes says the car will be both the fastest, at 318 km/h (198 mph), and the most powerful, at 430 kW (585 hp) and 516 lb-ft of torque, to ever have had the job. That job requires leading the F1 pack around any of the 21 tracks hosting races this year, anytime weather or on-track incidents call for its services. 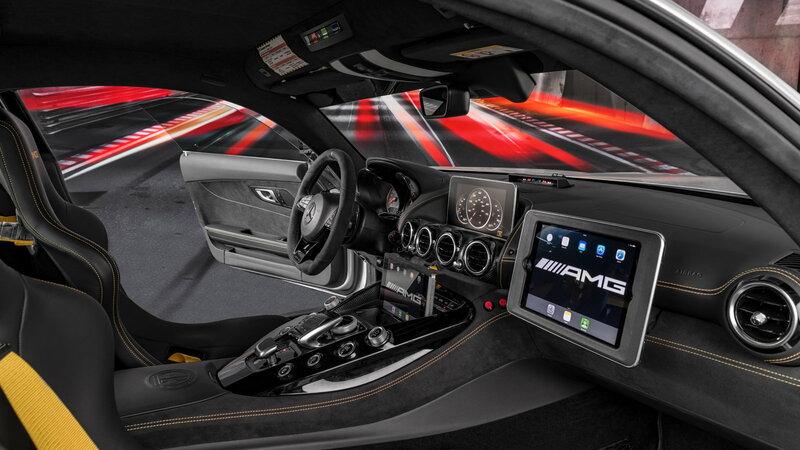 M-B says the GT R, which holds the position as the top-of-the-line AMG GT series model, is ideal for safety duty due to serious development time spent at the "Green Hell" of the Nürburgring as well as its kinship with the AMG GT3 racing car. 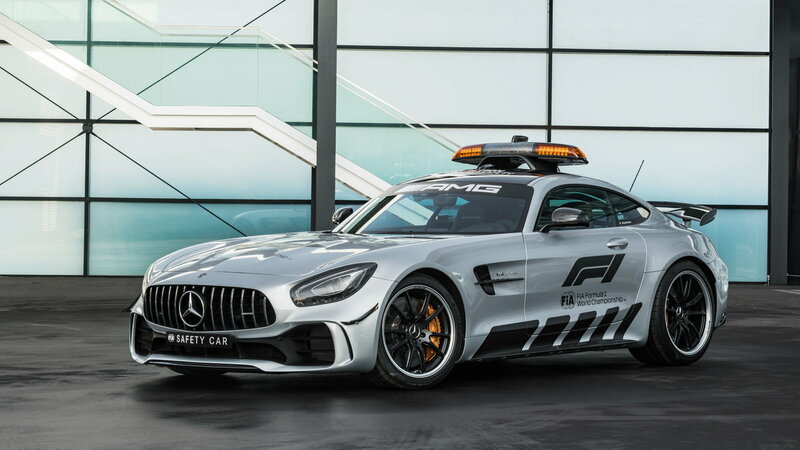 M-B, which refers to AMG as "the performance and sports car brand from Affalterbach," has added safety to that list of characteristics, and not for the first time—their creations have been pacing Formula 1 events since 1996. This year's model's front-mid 4.0-liter twin-turbo V8 engine not only makes record power and propels it to record top speeds, but also catapults the M-B missile to 0-60 mph in just 3.4 seconds. 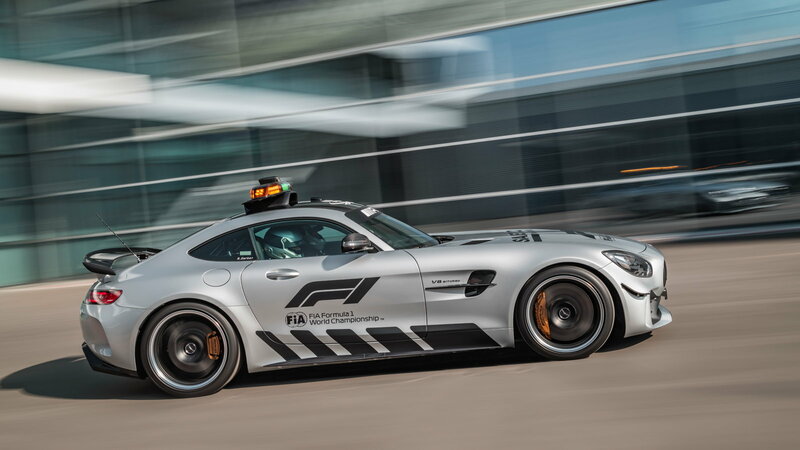 >>Join the conversation about the F1 Safety car right here in MBWorld. 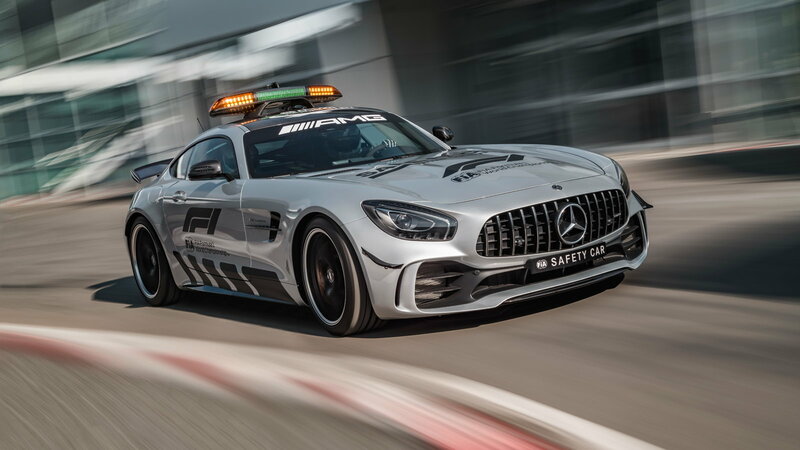 A Safety Car doesn't run on power alone—sizeable "front and rear wings" provide plenty of grip, and keep the GT R planted under the speeds necessary for pacing arguably the world's most advanced motorsport devices. The front of the car features M-B's AIRPANEL active air control system and the underbody benefits from active aerodynamics. In the back, the rear aerofoil is joined by a double diffuser. Wings aren't the only grip providers. Suitably light forged alloy wheels are wrapped in suitable sticky Pirelli rubber and are guided by active steering in the rear. The GT R's suspension is nearly as adjustable as those on F1 cars, with nine-way adjustability for the traction control system and an electronically-controlled adjustable coil-over system. The GT R needs all that power and all that grip. 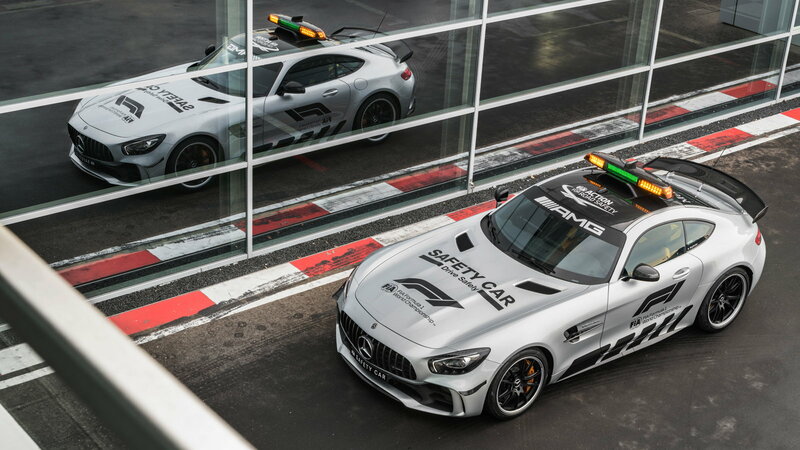 Because unlike at Indy where the pace car acts as a sort of rolling caution sign/roadblock, a Safety Car needs to fit an official FIA "requirements profile." 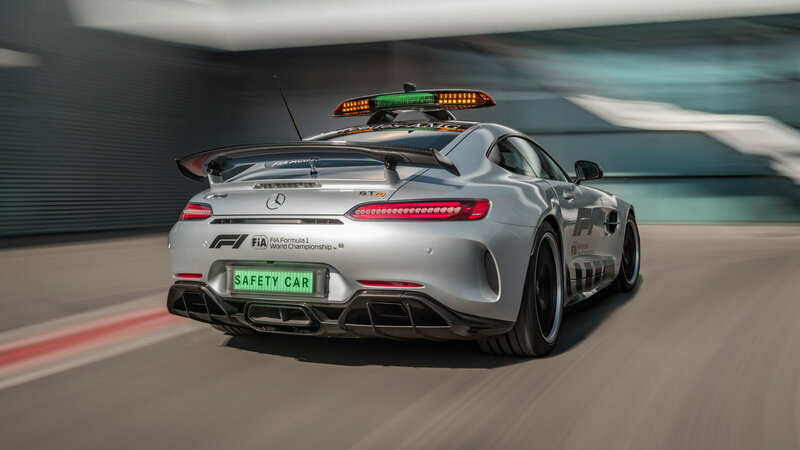 Critically, a Safety Car needs to maintain an elevated speed in order to keep the F1 cars' tire and brake temperatures up and keep engine temps cool. Fast, in this case, truly does equal safe. The men lucky enough to go to work in the GT R are driver Bernd Mayländer, whose job it is to drive the car with one eye on the track and another on the pack behind him, and co-driver Richard Darker, who stays connected with race control via radio. 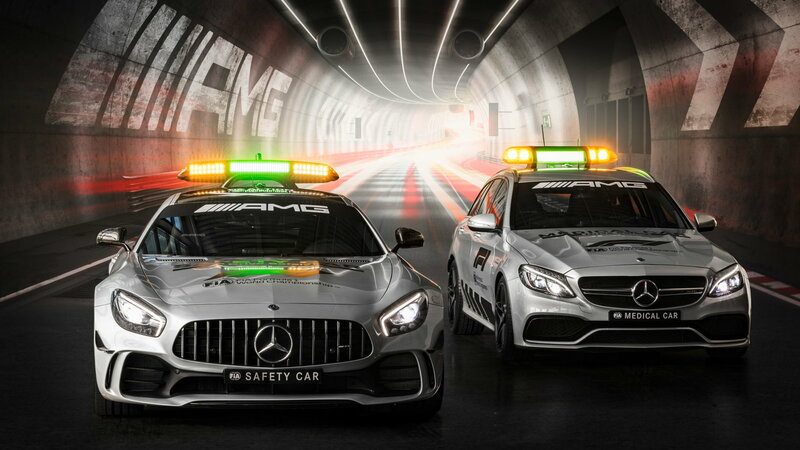 The Safety Car is fitted with two large screens, the one on the left is a feed of the TV broadcast of the event, while the display on the right can be set to show either lap times or an animated display showing the current positions of the vehicles. Info and data management for the visual info systems are facilitated by an in-car mobile WLAN hotspot. Mercedes also provides safety in the form of a Mercedes-AMG C 63 S Estate, which serves as the official FIA F1 medical car. Like the GT R, the C 63 has a two-man crew—Alan van der Merwe handles the driving duties, while FIA F1 deputy medical delegate Dr. Ian Roberts is responsible for the health and safety of the F1 drivers when needed. Together, they assist with emergency care, and the C 63 also provides room for one or two assistant medics from a nearby hospital when needed. The estate's luggage capacity allows it to carry a range of emergency gear including both a respirator and a defibrillator. All together, the team of Mercedes vehicles provides the help needed to avoid crises, and attend to any unfortunate occurrences. Keep an eye out for them this F1 season, and an eye out for Safety Car tributes on a highway near you.